In der aktuellen Version sind Backups nur für Webseiten und Datenbanken vorhanden. Dies ist ein Backport aus der devel-version für das nächsten Major-Release von ISPConfig. Die Backups von Emails funktionieren wie die Backups von Webseiten oder Datenbanken. Unter dem jeweiligen Mailbox befindet sich ein neuer Reiter mit dem Namen “Backups”. Ist MailBackup mit der aktuellen ISPConfig 3.1 kompatibel? Das ist ein Backport aus meinen Änderungen für die 3.1. Die Funktionen sind identisch und bei einem Update auf 3.1 bleibt alles im Wesentlichen unverändert. Könnten alle Nutzer mal im Verzeichnis “/var/backup/mail*/” nachschauen, ob da auch wirklich .zip bzw. .tar.gz Dateien drinnen liegen. Damit es bei mir unter der 3.0.5.4p8 läuft musste ich zumindest einiges ändern. Ich glaube es liegt ein Fehler in der Programmierung vor und wenn es bei einer Domain mehr als ein E-Mail-Konto gibt und nicht für alle E-Mail-Konten dieser Domain ein Backup angelegt wird, dann werden die Backups zwar in der Datenbank und der Weboberfläche angezeigt, jedoch im Verzeichnis “/var/backup/mail*/” gelöscht. Sollte das so sein, kann ich gerne meine angepasste Version zur Verfügung stellen. Thanks for the script very useful and well integrated into ispconfig3. it is probably something specific to my case (still need to investigate why it happens) but if it can help others. Das ist der genau das was ich gebraucht habe. So kann man bequem die Daten von Server zu Server umziehen mit Mails wenn der Kunde das wünscht. Nice Backport, is it possible to set different default values for the backup options, like “3 daily backups” of all mailboxes? Exactly the plugin i was looking for to move to a new server! How do I trigger the backup? I’ve looked in crontab and cron.d but I find no clues how to make a backup directly. Also within ispconfig (i have 3.0.5) I searched through all tabs but cant find a button to create or restore backup. And where will the backup be stored? The mail-backup is part of the cron_daily-script (include “/usr/local/ispconfig/server/mailbackup.php.inc”; in cron_daily.php). Thank you for quick response. I try to run the daily_cron with daily_cron.sh. I just updated the git: https://git.schaal-24.de/ispconfig/mailbackup/commit/f27deadfcbb24e9ffc1988eb382cacd10346f1f3. Please clone it again. i suspect it is the same bug with php 5.3 as you fixd for the dkmi patch. unfortunately i can confirm this. It´s now fixed in the git and the archiv. thanks for your help. Thank you! I’m wondering why it’s not added to official repo 🙂 Good work! This will be a part of the next major-release. nice! Can you show some Screenshots of the new Tab? Is this only possible for selected mail accounts or for all accounts of an mail domain too? I just added a screen-shot. As mentioned above you can set the backups for each mailbox. I don´t think it´s a good idea, to backup a full mail-domain. This leads to very big archives and it´s quite difficult to restore a single mailbox in this case. 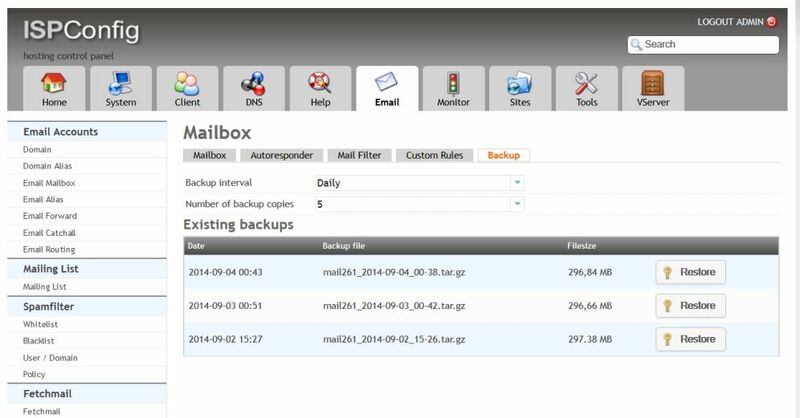 The Backup is equal to the web-backups, so your customers can set the backups for their own.